Freshly sliced granny smith apples and sultana’s in a deep tin shortbread casing. Baked to perfection! 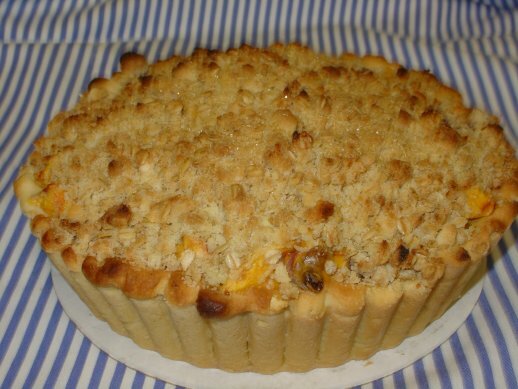 Moist Vanilla cake filled with fresh cream, apricots and almonds. Topped with apricot halves and roasted almond flakes. Buttery shortbread flan filled with a rich creamy caramel and topped with fresh banana and whipped fresh cream and Cadbury chocolate flakes. Vanilla sponge with a layer of banana mousse and a layer of banana caramel flavoured custard. Covered in a rich chocolate ganache and decorated with crushed hazelnuts and banana chips. Dark chocolate cake base layered between sour (morello) cherries with a hint of kirsch and whipped fresh cream. Decorated with lashings of cream, maraschino cherries and chocolate flakes. Vanilla sponge base layered with a divine butterscotch cream, topped with toffee wedges..
Creamy caramel in a chocolate covered shortbread flan topped with roasted macadamias and crunchy toffee..
A heavy flourless chocolate cake made with ground walnuts and Cadbury chocolate, covered in a rich chocolate ganache. 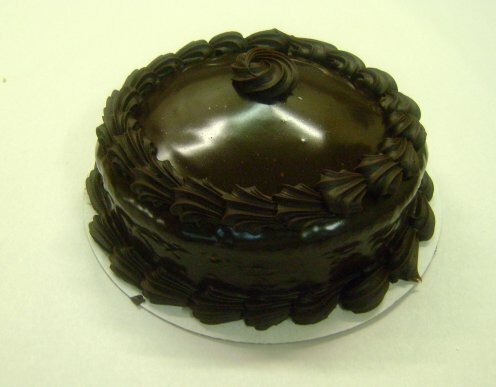 A very rich, moist, heavy chocolate cake covered in a rich chocolate ganache (for real chocoholics). A very light chocolate mousse, surrounded by many vanilla & caramel Swiss rolls. Chocolate cake layered with chocolate flavoured fresh cream and topped with cherries and flakes of Cadbury chocolate. Lemon based coldset cheesecake with a buttery shortbread base topped with fresh fruit and jelly and crushed peanuts on the sides (available in strawberry, cherry, lemon, kiwi, blueberry and passionfruit). A truly German style unbaked cheese cake made with fresh quark & whipped cream.. Vanilla cake layered with a rich chocolate butter cream topped with almond toffee wedges. "Black forest with a difference". Layers of vanilla sponge, flaky pastry, custard cream and morello cherries. Vanilla cake base layered with a light coffee butter cream and chocolate ganache and white chocolate flakes. Vanilla sponge base topped with a creamy continental custard covered in fresh fruit and jelly with roasted almonds on the side (available in mixed fruit, strawberry and sour cherry). 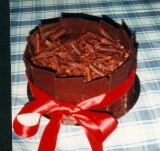 Multi layered marzipan sponge, filled with a custard wine cream, then sealed in marzipan and coated in Nestle chocolate. (a real German cake). Vanilla cake base layered with a light hazelnut and nougat cream. Finished off with crushed hazelnuts and more cream. A very rich, moist chocolate and caramel mud cake topped with caramel ganache and honeycomb pieces. A heavy hazelnut based cake drizzled with liqueur and filled with a continental custard. (Available in chocolate or vanilla custard, or both). Vanilla based cake layered with lemon curd and Midori (Melon liqueur) flavoured mousse. Topped with green & white chocolate curls. Traditional buttery shortbread case filled with tart lemon curd topped with a sweet fluffy meringue. Chocolate sponge, layered with a fluffy chocolate mousse, surrounded in chocolate shards, and topped with m&m's. Vanilla cake layered with an espresso cream, decorated with chocolate coffee beans and chocolate sprinkles. Freshly sliced granny smith apples, sultanas, cinnamon and custard, baked in an almond shortbread and topped with a crunchy crumble top. “Like Oma makes”. A crisp choux pastry ring filled with a creamy vanilla custard, fresh cream and fresh strawberries. “True blue Aussie tradition”. The fluffiest pavlova you will ever try. Topped with lashings of fresh cream, kiwi fruit, peaches, strawberries and almond flakes. Traditional butter shortbread case filled with sweet butterscotch coconut and pecan mix. Topped with pecan halves. 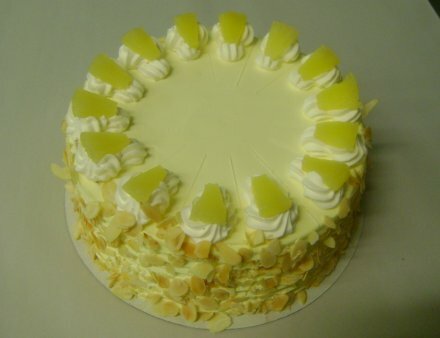 Vanilla cake, layered with fresh pineapple and fresh whipped cream, decorated with pineapple pieces and almond flakes. For "real chocolate lovers". Multi layered dark chocolate cake, with a rich German chocolate butter cream and covered in Nestle chocolate. Vanilla sponge filled with a vanilla custard cream and fresh strawberries. Topped with roasted almonds and strawberries..
Layers of fresh cream flavoured with a fresh strawberry pulp, between a light vanilla sponge. Decorated with strawberries and almond flakes. Vanilla cake filled with fresh cream and strawberries, soaked in cointreau. Surrounded in a white chocolate collar, topped with fresh strawberries and a strawberry & cointreau couli. “Refreshing and light and extremely yummy”. Freshly cut strawberries, kiwi fruit, pineapple, peaches and fresh cream layered between a light vanilla sponge. Topped with fresh fruit and roasted almonds. "Made the traditional way". Sponge fingers soaked in a coffee liqueur and layered with a mascarpone cream filling . "Yummy". "For a chocolate fix". Chocolate cake base, layered with a creamy chocolate mousse, surrounded in chocolate shards and topped off with chocolate curls.. Vanilla cake filled with a custard cream and topped with fruit. "Back to the basics". A light vanilla sponge filled with jam and fresh cream. Decorated with crushed peanuts and cherries. Rich chocolate mud cake, baked in a babka tin, covered in white or dark chocolate. Creamy yoghurt filling sandwiched between vanilla sponge. Topped with fresh fruit and jelly, decorated with fresh cream and toasted almond flakes. (Available in cherry, strawberry or kiwi fruit).